I love my home, and I want it to be pretty, but I’m NOT an artsy person. Not in the decoupage-ing, chalk board menu, paper-mache’d harvest kind of way. “This eye-catching pumpkin decorating idea couldn’t be easier: Just use Mod Podge to découpage a white gourd with pressed leaves. You can harvest the foliage from your own backyard!” Things that come easily for others, don’t come easily for me. I love looking at the results of other people’s artsiness, but my own is neatly contained in a paperback novel. Except… I’m a writer. So I DO write books. I’m not completely barren of artistic ability–just not in the crafting department. However, a family cannot be celebrated in the mother’s romance writing alone, so I do my part to make our apartment a home. Now, this probably doesn’t actually count as crafty because I didn’t craft it in any way. I picked it up from Winner’s with some birthday money, and I just love it! When I saw it, I HAD to have it. 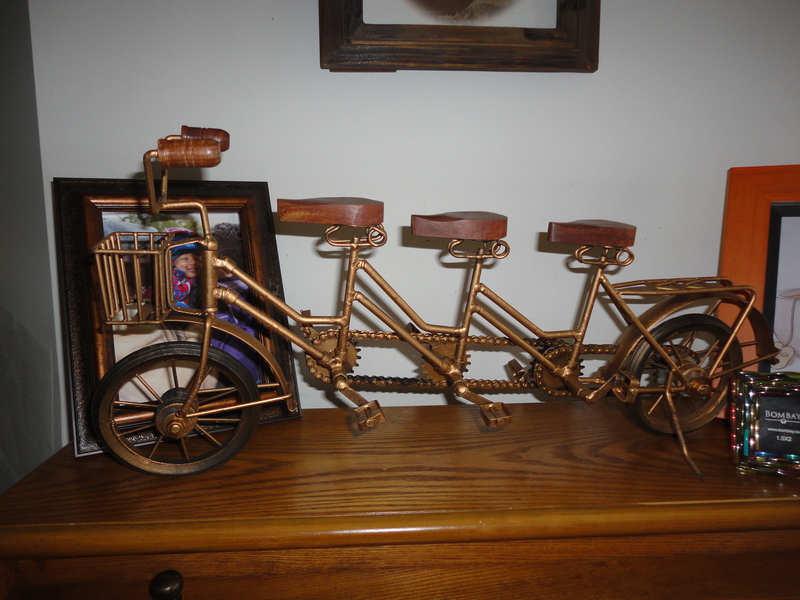 It’s my bicycle built for three! And a third seat… for their future child. Cool! I wish I had that artistic talent. Hope you had a great birthday! !